Mulayam Singh Yadav was made the Samajwadi Party party patron after a bitter feud in the Yadav clan climaxed with his son Akhilesh Yadav snatching the mantle of the party president from him at an emergency national convention on January 1. Earlier, Mulayam Singh Yadav (right) and Akhilesh Yadav had a public row over control of the SP. Lucknow: The Samajwadi Party today released a list of its 55-member national executive, headed by party chief Akhilesh Yadav, but the name of Mulayam Singh Yadav was missing from it despite signs of a thaw in the frosty father-son relationship. 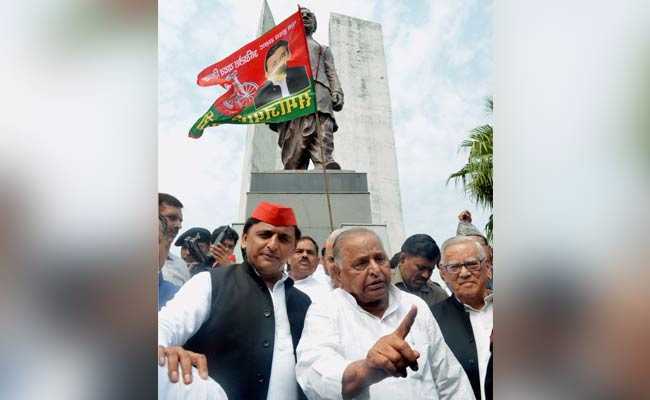 The list triggered speculation among political circles as to whether the Samajwadi Party patriarch will remain the party patron, especially after the father and son were seen together at a public event here last week. Asked about the post of Samajwadi Party patron, party spokesperson Rajendra Chowdhury said he was not aware of any such position. "The party constitution does not have any provision for such a post. I am not aware whether he is the patron or not," he told PTI. Mulayam Singh Yadav was made the party patron after a bitter feud in the Yadav clan climaxed with his son Akhilesh Yadav snatching the mantle of the party president from him at an emergency national convention here on January 1. Besides Mulayam Singh Yadav, the name of his brother Shivpal Singh Yadav was also missing from the list of national executive members. After getting re-elected as the Samajwadi Party chief in Agra earlier this month, Akhilesh Yadav had met his father here to seek his blessings. Akhilesh Yadav drove down to his father's house on October 7 and spent over half an hour with him. Before the Agra convention too, Akhilesh Yadav had met Mulayam Singh Yadav to invite him. However, Mulayam Singh Yadav and Shivpal Yadav had skipped the convention. The back-to-back meetings between the father and son kindled hopes of party workers of a reconciliation between them. Apparently to send a message that 'all is well' in the Yadav clan, Akhilesh Yadav had in Agra said that his estranged uncle Shivpal Yadav had blessed and congratulated him over the phone on his re-election. Shivpal Yadav also congratulated his nephew on Twitter. Days later, Akhilesh Yadav and his father shared the public space at a function at the Lohia Park here to mark the 50th death anniversary of socialist leader Ram Manohar Lohia. After paying floral tributes together at Lohia's statue, the father-son duo chatted amid slogan shouting by party workers. They later posed for shutterbugs. Mulayam Singh Yadav moved in a golf cart with his son and waved at excited party workers. Akhilesh Yadav, 44, also touched the feet of his 77-year-old father at the venue, triggering speculation of a possible rapprochement. As per the list released today by Samajwadi Party principal general secretary Ram Gopal Yadav, Kironmay Nanda has been retained as the party's national vice president. The executive has 10 general secretaries, including Azam Khan, Naresh Agarwal and Indrajeet Saroj, 10 secretaries, 25 members including Jaya Bachchan and six special invitees. The party has retained Rajya Sabha MP Sanjay Seth as its treasurer. Seth is a builder considered close to Mulayam Singh Yadav.